Are you eager to interact with God as you read Scripture? 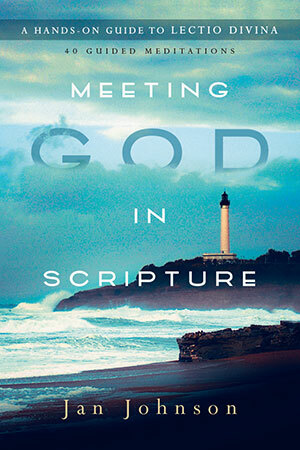 This book, Meeting God in Scripture: A Hands-On Guide to Lectio Divina helps you actually do that. Most books about this topic describe how to do it, but this book comes alongside you and helps you actually meditate on Scripture by offering 40 Scripture meditation exercises. This is a book you do (and can do over and over again), not just a book to read. Many of the exercises help you explore a gospel scene with Jesus: What would it have been like to have been a fly on the wall in the scene? Others lead you through Old Testament stories or Psalms or New Testament teaching in a way that you are likely to hear God speak to you through the passage. Simple background study of culture plus notes on scriptural context and original words are provided to immerse you in the passage. If you have questions about how to do lectio divina, you can read any of the 16 full page sidebars throughout that offer guidelines and insights about the process. Read Emily Freeman’s comments about the book as one of her fave books of 2017.